To see the latest version of facts by Canadian mainstream TV on recent operations in Cite Soleil, go to the link below. It's in French, but my summary and criticism below is in English. » continue reading "The latest on Haiti from Canadian Television"
The two part photo essay about recent arrests and spin by MINUSTAH is now online at Haitianalysis.com As the title of this blog entry suggests, the title of the photo essay is "Brutalized and Abandoned." 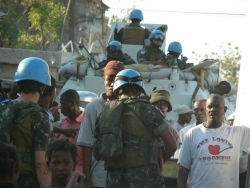 The photo essay addresses mass arrests, lies about social services in Cité Soleil and the demands of the victims of MINUSTAH.